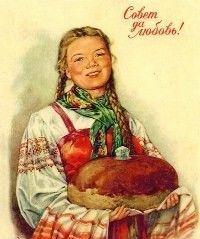 “Хлеб всему голова” (Bread is the head of everything). This Russian proverb explains the importance of bread in Russia for many centuries. Bread is life. Bread is hospitality. Salt, on the other hand, is associated with friendship for ever. In ancient times, salt being highly taxed, was a very expensive and prized foodstuff. A russian saying goes: “Человека узнаешь, когда с ним пуд соли съешь” (You never know a man until you have eaten a pood of salt with him). A pood is a Russian measure equivalent to approximatively 16 kilograms. But long before the Russian Empire, salt was already a symbol of protection, guarding the house from evil forces. “Хлеб да соль” (bread and salt) is not only an expression in Russia, but also the way to greet people since centuries, an invitation to hospitality. There is even a word “Хлебосольство” consisting of the word “Хлеб” (bread) and “Соль” (salt) and can be translated in English as “hospitality”. Traditionally, Russians would bake a large, nicely decorated bread to welcome special guests. The bread, with a small salt container on top, was respectfully presented on a рушник (a nicely embroidered cloth). The guest in turn would break off a small piece of the bread, dip it into the salt and eat it. Still nowadays, when the wedding ceremony is over, the parents of the bride or bridegroom receive the newlywed couple with bread and salt at their home.